Meeting etiquette makes those hours easier and more efficient. Meetings are a necessary evil: you spend hours in meetings every week solving issues, planning, updating, etc. They can hardly be avoided. 1) Do not arrive more than 5 minutes earlier. 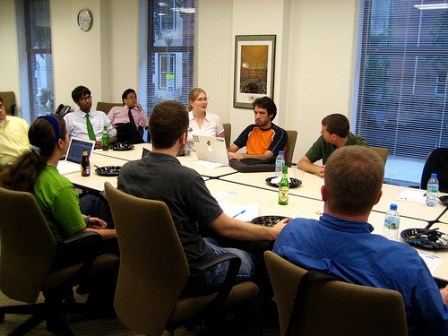 The person organizing the meeting can be doing last minute preparations, adjusting equipment, or preparing materials for the attendees that were ordered 10 minutes before the meeting. The organizer needs all the time available in order to have everything ready. 2) Do not be more than 5 minutes late. If you can’t avoid being late, let the meeting organizer know in advance. This way he/she can adjust the agenda, reserve a chair for you, have your materials ready (notepad, pens, hand-outs). And, when you arrive, do not distract everybody with your briefcase, asking for coffee, whispering to other attendees, or crossing the room because you want to seat near the podium. 3) Basic meeting etiquette says turn off your cell phone, pager, watch, timer, or any device that causes distraction and interruption. Give the meeting your undivided attention. 4) If you must leave the meeting earlier, tell the organizer in advance. This way your chair can be arranged to be near the exit, so you don’t disturb other attendees when you depart. 5) If you miss a meeting, apologize giving solid reasons, not excuses. Try to reschedule at a time that best suits your counterpart. Follow-up with a written apology with an assurance that it won’t happen again, and make sure it doesn’t! 6) Part of meeting etiquette is handling attacks with style. If during your presentation someone starts attacking your ideas and comments, do not counterattack. Never. Instead, emphasize the positive side of the attacker’s comments, like “there can be some areas that definitely need some improvement”. Avoid the “you” answer: this will prompt the attacker to raise the level of negative comments against you. 1) Determine if a meeting is the best way to solve the issue at hand. Some subjects can be solved with a conference call or even with a thread of emails. The point in solving any issue is doing it in an effective and time-efficient way. 2) Once it is determined that a meeting is necessary, select your invitees carefully. 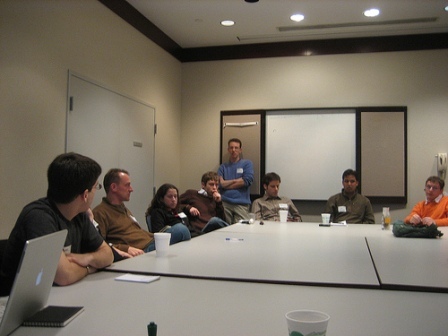 Each participant must add significant value to the meeting. 3) Set the agenda. Divide the issues per time slot. For instance, decision-making issues, problem-solving issues, etc. Also, make sure each of your invitees is available at the time he/she is required according to the agenda. 4) Select the location of the meeting carefully, especially if clients are involved. Finding a neutral place (not their place, not yours) is a convenient way to avoid interruptions and to have all attendees focused on the subject at hand. 5) Avoid scheduling meetings on Mondays and Fridays. Mondays are hectic and Fridays can be used by some of your attendees to have a long weekend. 6) Ask your attendees if they will provide hand-outs to other participants. If so, ask them to provide them to you no later than 2 days before the meeting, so you can organize them in a nice package for everyone. Include a copy of the agenda on the first page. 7) Give your attendees a meeting invitation with 2 to 3 weeks in advance with the copy of the first draft of the agenda. 8) Give your attendees a copy of the final agenda 2 to 5 days prior to the meeting. This way each of them will know how early they should arrive, how long the meeting is scheduled to last, if breakfast is included, if after-meeting entertainment is included, if lunch is included and if so, give you any diet restrictions so you plan the menu accordingly, etc. 9) During the meeting, keep the issues on track, adjusted to the agenda. It is easy to make quick “detours” to other subjects and waste time. Make your best effort to control “problem people” and keep the meeting running smoothly and on time. 10) At the end of the meeting, give a summary stating action plans, deadlines for certain tasks, and any future meetings and follow-ups. Also, thank special guests and the rest of the attendees for their participation. Meeting etiquette is an art, whether you are a guest or the organizer. You will find challenges during every meeting, but the above rules give you a solid ground to start every meeting with the right foot.